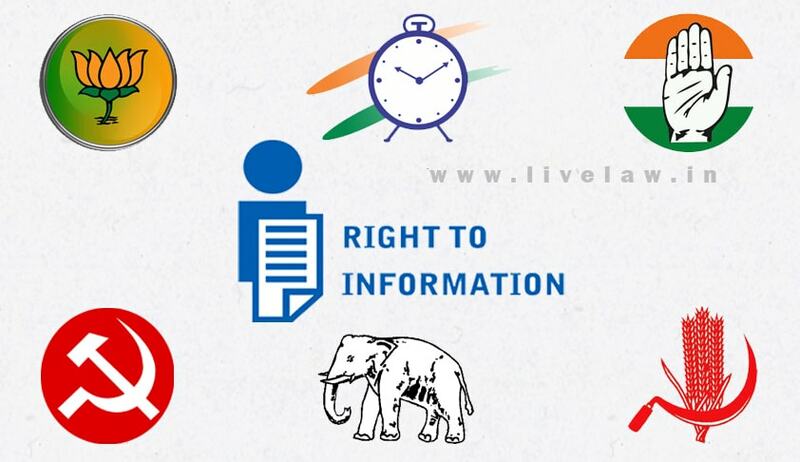 Why Political Parties Should Be Brought Under The Domain Of Right To Information Act? Once again, the matter whether political parties are answerable under the provisions of Right to Information Act, 2005 or not reached Supreme Court of India(SC). A public interest litigation was filed by Advocate Ashwini Kumar Upadhyay requesting the apex court to declare political parties as ‘public authorities’ under Section 2(h) of the above Act. The issue raised in the petition is quite pertinent as political parties as ‘institutions of governance’ are second to none when it comes to their importance in any democratic set-up. The same issue was raised by Association for Democratic Reforms and RTI activist Subhash Chandra Agrawal before the Central Information Commission (CIC) earlier. Maturity of institutions is the test of better democracy. The more mature institutions result in democratization of processes and systems. The relevant question here is, how to make institutions mature. Institutions mature when they are made open and accountable. Transparency and accountability are not only constitutional values but also tools to measure the maturity quotient of any system, which claim itself to be democratic. Since law is considered to be the agent of change, the agency of law is often employed to bring about desired positive changes in the system. Right to Information Act, 2005 (hereinafter referred to as RTI Act) is such a law, whose whole aim is to make processes more participatory and institutions/systems more transparent and accountable. The governments formed after elections are basically run by the ideology and ideas of political party(s) which has emerged victorious. Therefore, the work and functioning of political parties is akin to governmental functions. Functions of public nature require political parties to be accountable under RTI Act as ‘all authorities of public nature’ are covered under this transparency law. Catena of questions confound our minds when it comes to the nature and functioning of political parties. These may be, whether political parties are liable under the RTI Act? What is the law on this point? How courts have treated these questions? All these pertinent questions demand instant answers. The controversy whether political parties are covered under RTI Act or not, arose when political parties were petitioned for disclosing their assets and other liabilities by some NGOs and social activists who were of the view that political parties are ‘public authorities’ under section 2(h) of RTI Act. This sub-section defines ‘public authorities’ and says that all bodies created by the Indian Constitution or Parliament or State Assemblies by enacting a law; other bodies which are substantially financed/funded directly or indirectly by the government of India, are public authorities. On 3rd June, 2013, the CIC decided that political parties are obligated under the provisions of the transparency law to answer the queries of the petitioners and directed the political parties to appoint public information officer. The CIC held that political parties enjoy various benefits directly or indirectly from the government of India. Tax exemptions under the Income Tax Act, land for offices of political parties on concessional rates, allotment of free time on Doordarshan/All India Radio and supplying electoral roll copies free of cost during elections will constitute indirect funding by the government and hence all political parties are obligated to share information with the people as section 2(h), which defines the word ‘public authority’, provides that bodies or organizations receiving substantial indirect funding from the government will be answerable under the RTI Act. Not only this, political parties perform functions like government bodies and they have monopoly over selection of candidates, who will ultimately form the government; therefore they cannot escape the scrutiny by the common people of their functioning. No political party complied with the order of CIC and eventually the Government of India in consultation with other political parties decided to bring a bill to nullify the order of CIC. These purposed amendments to RTI Act were to be retrospective in effect. A lot of controversy was created on this issue and the government of India decided not to press for the amendments and bill was referred to the standing committee of Parliament for further consideration in finer details. Observing the dilly-dallying attitude of the government, the Association for Democratic Reforms went to CIC for the compliance of its earlier order of 3rd June, 2013. CIC in March, 2015 reiterated its earlier ruling but expressed its inability to get its decision implemented for lack of execution machinery. Ultimately, the matter reached to Supreme Court of India. The apex court has to decide this contentious issue of whether political parties are liable to answer the peoples’ questions under the transparency law. There is no mention of political parties in the original text of the Indian Constitution. But later, political parties were mentioned in the body of the Constitution through Xth Schedule dealing with Anti-defection Law. So, the Constitution recognized the existence of political parties and expects them to conduct themselves as per the democratic spirit of representing the people of India and their aspirations. Moreover, political parties are recognized and registered under the provisions of Representation of People Act. So, in a way these parties are either recognized by the Constitution or created by the Act of the Parliament i.e. Representation of Peoples Act. The RTI Act section 2(h) provides that if any authority or body or organization is created by the Constitution or by the Act of Parliament, that authority or body or organization will become liable under the transparency law to disclose information and share it with the common people of this country. Under this provision, political parties are ‘public authorities’ and hence liable to appoint public information officer and disclose information. The SC has the onerous responsibility of deciding these contentious issues as their logical and reasoned culmination is in the larger interest of democracy. Bringing political parties within the domain of RTI will help in deepening democracy. Democratic institutions have inhibition for opening-up. There is a need of applying the ‘doctrine of shaking up institutions’ which have insulated themselves from the scrutiny of people. Not only political parties have insulated themselves, various other institutions including higher judiciary face less public scrutiny and criticism. In order to be a mature democracy every institution has to open up or it should be made to open-up by ‘shaking it up’. It is high time political parties and higher judiciary is brought under the ambit of RTI. There are enough exceptions or restrictions on disclosing the information in order to protect the integrity and reputation of the democratic institutions. It is heartening to know that SC has started suo moto the process of opening-up. The collegium of apex court, headed by present Chief Justice of India Justice Deepak Misra, decided to upload and disclose the reasons for appointment of Supreme judges and appointment and transfer of judges of high courts on its website. Its opportune time and occasion to reign in political parties and to make them more transparent and accountable to the people. Sooner the better is the mantra. If court decides the matter soon, it will benefit the democracy in the longer run. While attempts are being made to make the functioning of the political parties more translucent by the executive by amending tax laws and introducing ‘electoral bonds’ making the funding process more non-transparent, the judiciary’s role becomes more important. One also expect the highest court to simultaneously decide a petition in which the question whether the office of Chief Justice is covered by RTI or not is pending the decision of the Supreme Court since long. Political parties and higher judiciary need to be shaken- up from their inhibitions to face trial in the court of the people. Issues raised in the current public interest litigation before SC are old but it raises fundamental questions again which demands innovative and new solutions by the apex court. Abdul Hafiz Gandhi is the Head of the Department of Law, Unity Law & Degree College, Lucknow.